In 1996 no-one knew who Joanne Rowling was. At that time she had gone through a divorce, had no job and was bringing up a child on her own. Then in 1997 she published her first book, Harry Potter and the Philosopher's Stone, and everything changed. The series of seven books has brought her untold fame and fortune; the 2008 Sunday Times Rich List named her as the twelfth richest woman in Britain, whilst last year Forbes estimated her net worth to be around $1 billion. But you really know you've made it when you appear in The Simpsons as yourself, as she did in 2003. With Potter and his pals finally put to one side, J.K. Rowling has written her first novel for adults. This means no Potter, Hogwarts or Voldemort. In fact the goings-on in Pagford couldn't be further away from her world of wizardry. Pagford is a town with a vocal community. This is proved by the sudden death of Barry Fairbrother, a member of the Parish Council. Of course his passing is greeted with shock and sadness, but it also stirs the pot as to who should succeed his place on the council. This vacancy causes more of a stir, due to a contentious issue, that of a council estate known as "The Fields"; the area has managed to split opinion as to whether it should remain part of Pagford, or now fall under the jurisdiction of nearby city Yarvil instead. As the debate grows, tension within the families concerned begins to show. And while the adults are taking it ever so seriously, their teenagers are getting sick to death about it, to the point where some of them decide that the only way to make their point heard is to target the Parish Council website. And when a voice from the dead airs his opinions, the whole community is left shocked by the fallout. After writing so much Potter waffle, it's no surprise that Rowling wanted to challenge herself as a writer with something completely different. 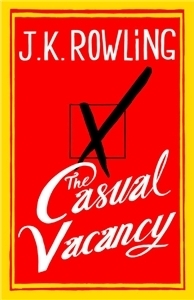 And The Casual Vacancy is very different indeed. What it clearly illustrates is that Rowling is a technically able writer. She manages to give this community an authentic voice, getting under the skin as she does of the families involved. Surprisingly her Achilles' heel here is her inability to entertain. Pagford is full to the brim with objectionable characters. It's fine to examine the dark undercurrent of a society, but everyone there is so incredibly dull and not at all interesting. There is not one character that is worth rooting for, and none really worth empathising with. And when the book is all about character and not about story development, you find yourself in a pickle. Sure they all feel real enough, but you wouldn't want to invite any of them around for a drink and a gossip. Maybe it will take Rowling a little time to get into the swing of things where adult fiction is concerned, and although she's proven to be a wizard with words in the past, it's fair to say that her first foray into the adult market lacks any kind of real magic whatsoever.